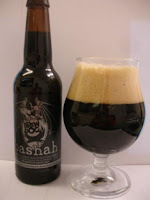 At the tasting Brewdog held a few weeks back, I tried Bashah for the first time. Bashah was brewed as a collaborative effort between Brewdog and Stone Brewing and is a black Belgian double IPA. When I first heard about this beer I couldn't understand how it would work. Big hop flavour should be the protagonist in an IPA and yeast flavours should dominate anything you specifically label as being brewed with Belgian yeast. How can these two distinct, main-event flavours work alongside each other? Despite this however, when I tried it I was pleasantly surprised. I don't think I'd describe it as a true double IPA, Belgian yeast or not, but the overall taste is good. So good infact that I've decided to attempt something similar myself. So, at this stage, I'm just throwing a few ideas around and trying to put something that resembles a recipe together. For me, an IPA should have a clean, slightly thin, dry flavour. I don't want too much to come from the malt because it should be the hops that steal the show. But, be that as it may, I don't like the idea of a dark beer without any maltiness at all. So, aiming for somewhere in the middle, I'll use Carafa III to give colour and some roasty caramel flavour, without it becoming too dominant. On the special grain front, I'll also use a minimal amount of crystal and chocolate to help the caramel/toffee flavour along. Hops. This is meant to be an IPA, so I want hop flavour to be obvious. Target for bittering, giving about 60 IBU's. Personal taste won't let this get any higher. I want this to be bitter but not over the top. Amarillo and a small amount of Fuggles for the aroma and flavour hops, the idea being that these will bring a spicy, orangey, citrus flavour to the beer. The yeast needs to be Belgian but I'll split the batch and go with a S04 as a control. The Belgian half will use Safbrew T58. I want the ABV to be around 6-7% so that you get an alcohol hit on the nose and a slight warming sensation in the mouth. An ABV this high will be about right for 60 IBU's and will also lend itself to ageing. So, put this together and you hopefully get a dark beer with yeast, caramel and toffee, orange and spice. Think Terry's Dark Chocolate Orange and you're not far off where I'm aiming at. Re-reading through this, have I ended up with a black Belgian IPA? Probably not. I do think I've got the basis for something that could be pretty tasty though. This blog entry is a bit out of date now. I brewed the beer over Christmas with some slight modifications. I'll update the blog with progress and a look at how it turned out soon, so stay tuned for that. I wouldn't mind tasting that, any chance of a snifter? Still conditioning at the moment (and very much a work in progress), I'll see what I can do though. If I recall correctly there was a picture of the recipe on the BrewDog blog when they brewed it. You could copy that and scale it down to a homebrew batch size, though it used some trendy hops that might possibly be difficult to get. Any chance of the recipe you used? Wouldn't mind having a go myself. If you fancy it, would happily swap a bottle of yours for a bottle of my Imperial barrel aged oatmeal stout.